Every summer our family hit the road in our 1965 sky blue Pontiac Catalina for a family vacation. One year our destination was the Great Smoky Mountains with stops in Pigeon Forge, Gatlinburg, and Fontana Dam. On another trip, we followed my Aunt Sarah and Uncle Vernon and their popup camper to the mountains of North Georgia. Six Flags over Texas highlighted another trip. Perhaps my favorite summer destination, though, was Destin, Florida. Back then, Destin was a sleepy coastal town with some of the most gorgeous white sand beaches in the world. We always stayed in a typical 1960s pastel-colored motor lodge with a neon sign blinking “Vacancy”. No sooner than we’d checked in, I was in my bathing suit, beelining for the pool. I vividly remember my excitement on those trips. I wasn’t sure what to do first; I wanted to everything at once. The beach, the gigantic water slide, the souvenir shops hawking tacky beach chachkas, and the goofy golf course all vied for our attention. Of course, eating was high on the priority list for little Billy. All the vacay activities kicked my ravenous appetite into high gear. North Mississippi didn’t offer much fresh seafood, so having access to right-out-of-the-water shrimp, fish, oysters, and scallops made me a happy boy. I’m sure Destin offered me my first experience with scallops, and it was love at first bite! Every spring, I’m always looking for ways to use peas. I buy fresh ones whenever I can this time of year, but frozen ones are always a great substitute if you can’t find fresh ones. My love of scallops and peas brought about this recipe. I’m a big pesto fan, so adding peas to my favorite basil pesto recipe was a no-brainer. I paired seared scallops with the pea pesto and the result was a hit. If you’re looking for an elegant dish for a dinner party, try this recipe. The pesto can be made ahead of time, so all that’s needed to complete the dish is a few minutes to sear the scallops. Serve with mixed greens or your favorite vegetable and you’ve got a healthy and delicious dinner. 1. Place peas, pine nuts, garlic, basil, lemon zest, and lemon juice in the bowl of a food processor. Process until well combined. With processor running, slowly pour in olive oil. Process until smooth. Transfer mixture to a medium bowl. Stir in cheese, 1/4 teaspoon salt, and 1/4 teaspoon pepper. 2. Season scallops with salt and pepper. Heat a large skillet over medium high heat. Add butter and olive oil. When pan is almost smoking, add scallops, leaving space between each one. Sear for 1 to 1 1/2 minutes on each side or until lightly browned. Do not overcook. Transfer to a plate and let rest for 2 to 3 minutes. 3. To assemble plates, spread a spoonful of pesto on each plate. 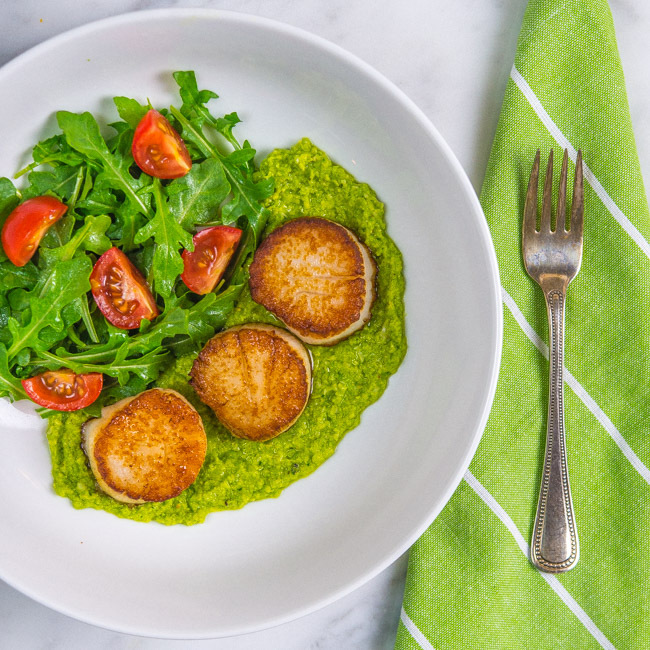 Place three scallops on pesto and serve with mixed greens or your favorite vegetable. Now, to be honest, scallops scare me. I love to eat them but I’m scared to cook them and mess them up. But this looks like a recipe I can handle (yay for searing!) And the colors are SO gorgeous. Thanks for the courage, Bill! Be not afraid, Julianne! Scallops are a cinch to sear, 1 to 2 minutes each side. Couldn’t be easier!